These banner stablizers can be used as a more cost efficient stabilizer for our Grip-Tite or Galactic Banner Holders. You want your signage banners to look professional and sturdy in your retail store. 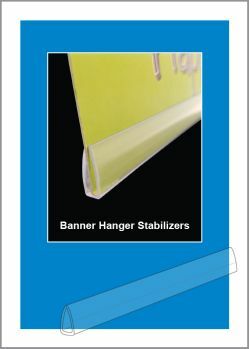 Banner Hanger Stablizers attached to the bottom of a banner, made of durable and rigid PVC, are an easy way to make that happen. You have 22", 24", 36" and 48" versions to chose from. We produce a vast array of sign hanging components, if you are not sure which works best, ask for a free sample to test it out in your environment. Minimum quantity for "22" Banner Hanger Stabilizer, Clear, 836-22C" is 10. 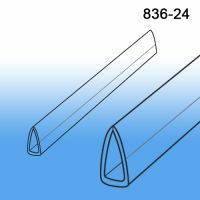 Minimum quantity for "24" Banner Hanger Stabilizer, Clear, 836-24C" is 10. 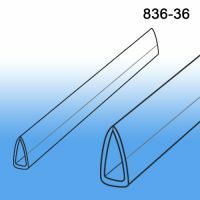 Minimum quantity for "36" Banner Hanger Stabilizer, Clear, 836-36C" is 10. 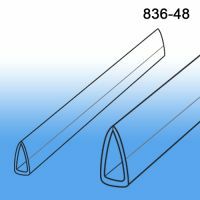 Minimum quantity for "48" Banner Hanger Stabilizer, Clear, 836-48C" is 10.